For a college football team tied with UCLA and Wisconsin for the most tight ends currently on NFL rosters with four, Stanford football utilized its historically talented position very little last season. Stanford’s tight ends made just 10 catches for 69 yards in 2013, and multiple-tight end sets appeared on the field much less often than in previous years — when Zach Ertz ‘13, Coby Fleener ‘12 and Levine Toilolo ‘13 manned the position. In 2014, expect that to change. After redshirting their first year on the farm, freshmen Austin Hooper, Greg Taboada and Eric Cotton join a group with junior Charlie Hopkins, senior Eddie Plantaric and sophomore Alex Frkovic, among others, that hopes to earn playing time and replicate the production of some of its Stanford tight end predecessors. Stanford’s classic three-tight end set was not used often last season, in favor of the jumbo formation when offensive linemen, like sophomores Josh Garnett and Kyle Murphy, lined up as tight ends. While bringing extra offensive linemen on the field has been a favored maneuver of the Cardinal, tight ends rarely saw the field in that formation or in any other formation, with linemen assuming the jumbo tight end roles and wide receivers serving as the foundation of the passing game. However, the addition of the three talented tight ends coming off of their redshirt seasons may signal a return to frequent action for the position. Athleticism has clearly returned to the position with the 6-foot-6, 242-pound Cotton, 6-foot-5, 231-pound Taboada and 6-foot-4, 254-pound Hooper looking to assume major roles. Yet, the three young tight ends have impressed on the field this spring not only with their physical prowess, but also with their mental development. The tight ends may be the last piece of what could be a dominant aerial attack this season for the Cardinal. Shaw raved about the depth of the wide receivers at many of this spring’s practices. A tight end that can boost the intermediate passing game, or even several tight ends that can contribute in this regard, would give the Cardinal an unprecedented wealth in the passing game. Although playing time is up for grabs, the tight ends know that snaps will not be given to them simply because of the void at the position. Once summer practices begin, four-star recruit and incoming freshman Dalton Schultz — the nation’s top high school tight end — will arrive and reinforce the position as well. 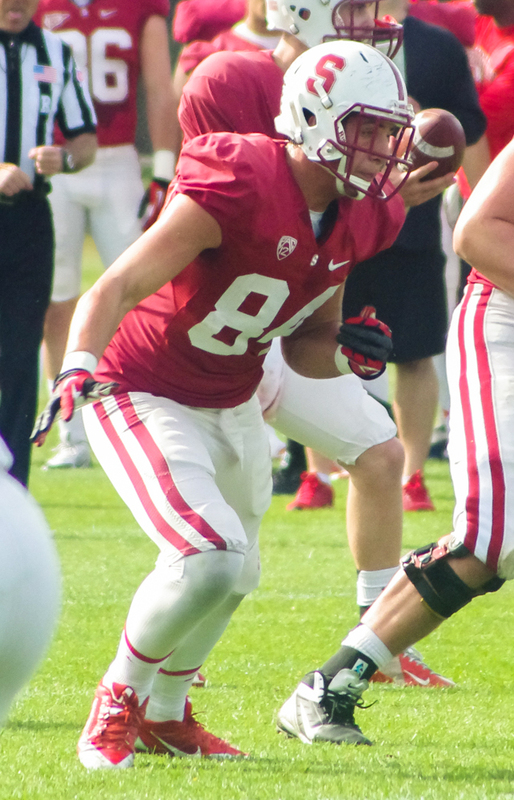 Even though most Stanford freshmen tend to take a year to add strength and learn the playbook before stepping on the field, Schultz figures to at least challenge for snaps at tight end this summer. Contact Michael Peterson at mrpeters@stanford.edu. Michael Peterson is a senior staff writer at The Stanford Daily. He has served as a beat reporter for football, baseball and men’s soccer and also does play-by-play broadcasting of football and baseball for KZSU. Michael is a senior from Rancho Santa Margarita, California majoring in computer science. To contact him, please email him at mrpeters ‘at’ stanford.edu.